!! Sri Sachidanand Sadguru Sainath Maharaj ki Jai !! We Bangalorians were blessed to have Veena Didi recite Sai Amrit Vani at their son Anuj Gupta’s Home in Bangalore. (Baba ko Koti Koti Pranam) My special Thanks to Baba for giving me the opportunity to attend the Sai Amrutvani in Bangalore, because from last year I am trying to go Delhi to attend the same but Baba Blessed me to attend it here only. I went to attend the Recitation with My Wife and My friend. Sai Amrutvani Recitation starts at 11.00 am. I gave a Small idol of Baba to Veena didi to keep in Recitation at 10.35 am. I was Thrilled and shocked, because by 10.40 am only UDI (Vibhuthi) starts Oozing from my Idol...(Photo attached merababa.jpg). Myself and some other devotees brought the (Prasad) Sweet, Fruits, Biscuits etc..,Sai Amrutvani Recitation started at 11.00 am. and ended at 12.00 Noon.How ever the Recitation completed Veena Didi’s Lap was filled with UDI (Vibhuthi)...Fruits, Biscuits and Sweets were eaten by Baba. And Udi (Vibhuthi) Oozing from the Photos and Idols and a Coin also.Teerth (Charanamrut / Holy Water) was coming from Padukas. Later Veena Didi graciously applied the UDI to all devotees forehead one by one. Veena Didi also gave Charna Amrit (Holy Water) to all the devotees and distributed Pocket size photos of Baba. 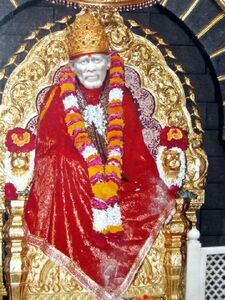 Some of the fruits and bhog (food) were blessed by Baba and were eaten by Baba Himself, which was later distributed as prasad to all the devotees. We collect the Charanamrit in a small size bottle. Didi spoke to all the devotees (some individually) and listened to their concerns and advised them spiritually. 30th Dec. on Baba’s Photo at Baba’s Lotus feet “OM” appeard in UDI. The experience I had cannot be described or explained in words. I Couldn’t believe everything was happening in front of eyes. Through Sai Amrutvani Recitation I (Everyone) got the opportunity to feel the Presence of Baba. A strong positive energy filled in the entire house and everyone could feel the vibrations of the recitation. Really Veena didi, and Ashok Brother are Highly Blessed by Baba and definitely they were with Baba in their previous Birth. According to my knowledge I proudly say that Multi Miracles of Baba in one place that also every week (Thursday) is only possible in “Sai Amrutvani” Recitation (with Veena Didi)..